Creating a new game and publishing it yourself can be a challenging endeavor. However, more and more people are doing it with the help of Kickstarter. Ryan Wolfe tried and failed on his first attempt to fund Shadowstar Corsairs. However, he is back again with an improved campaign. I recently asked him eight questions about his game and Kickstarter. Who are you and what is your gaming background? My name is Ryan Wolfe. I started gaming with RPG’s in the late 70’s and since I was also a crazy Star Wars kid, I gravitated towards the few science fiction games available at the time. That evolved into a love of all things starship related. I was a video game programmer for several years, then part of a small company that made role playing game products. I did starship designs and deckplans for the Serenity RPG and the Battlestar Galactica RPG, and eventually started my own line of ships (“Future Armada”) as well. The ships and setting from that line became the foundation upon which Shadowstar Corsairs was built. What were some of your gaming influences that got you into designing your own game? Merchants & Marauders really stands out in my memory as being the one where I thought it was really cool to have your own ship and the freedom to choose a path. Of course I thought it would be more interesting if it were set in space. Later, games like Firefly and Xia filled a similar role, but by that time I had also decided to mix in strategic area control elements from some of my other favorite game like Twilight Imperium (3E) or Game of Thrones (2E). I not only wanted to be captain of my own ship or small fleet, but I wanted a larger context in which to work. Instead of the story being only what this one ship and crew is doing, I wanted the ship to be just one vital part of a larger undertaking. 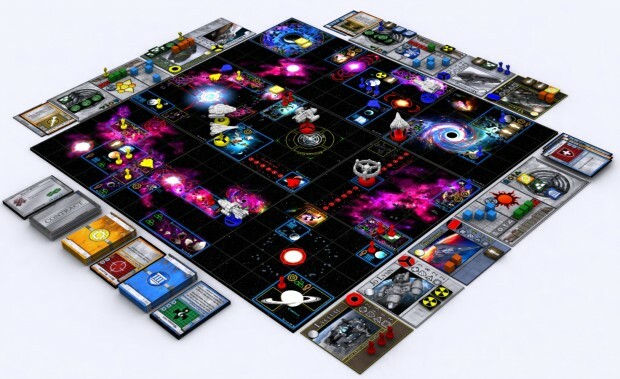 Isn’t designing a space 4X game a bit ambitious? It is, but in Shadowstar Corsairs doesn’t have all of the X’s. Since the board layout is known at the outset eXploration isn’t a factor. You definitely still eXpand and eXploit. The eXermination is optional, though it’s usually a lot of fun. Because the game is a mix of tactical combat and strategic planning, the 4X parts are fairly simple mechanically. This keeps things faced paced, and doable from a design perspective. What features of Shadowstar Corsairs differentiate it from other 4X games? The aforementioned mix of short term tactical combat and long-term strategic positioning is probably the biggest thing. The pacing is faster and the scale is smaller than most 4X games. Rather than conquering an entire galaxy you’re vying for control of the Shadowstar Expanse, which is just handful of stellar systems (though thick with debris and anomalies). You have at most three ships and they are mainly armed merchants or scruffy mercenaries – not vast armadas of war ships. Though you also have cargo shuttles and ground troops, these are individual vessels and small squads rather than entire armies unto themselves. What options are available to make each game of Shadowstar Corsairs feel unique? There are at six different types of player ships with which to start (and up to 9 with stretch goals and the exclusive edition). Players begin with any one of these can hire a couple more during the course of the game. Each ship has unique stats and so different combinations of ships avail themselves to different strategies. They can also be improved and upgraded with different cards. The modular board consists of several 8 inch by 8 inch sectors. These are two sided, unique tiles, and can be arranged in many different ways so the board is different in every game. The typical game uses a 3×3 layout of sectors but even this can change from game to game. Lastly, there is a huge variety of Technology, Politics, and Contract cards. Which of these come up in any given game can have a dramatic effect on how things play out. What role will ground troops have within Shadowstar Corsairs? The ground troops, which I call “Crew” (for Combatant/Resource-Extractor/Worker) , are a vital part of the game. They can hold and defend territory, both from other ground troops and from ships. Without them, the player’s ships and shuttles would be stuck sitting still in order to harvest resources and fend off invaders. With Crew available to do that job, the ships are free to travel and do more important things. Of course these same Crew can be stationed on board a ship too – making it more formidable in a fight. What did you learn from your initial launch of Shadowstar Corsairs on Kickstarter? The main thing I learned was that my funding goal was crazy high. The manufacturer that I was working with required a minimum order of 2500 units because of the custom miniatures. This resulted in a super high funding goal- but a few other games had hit that goal so I thought I could too. For the relaunch I found a manufacturer who only required 1000 units be made. This more than cut my goal in half and made a second try possible. I also learned that backers really wanted me to focus on the ship miniatures. It makes sense since they are cool really and set the game apart. So I included more player ships with the base game, added more as stretch goals and an exclusive option, and added pledge levels where people could just get the ships without investing in the whole game. I made the first stretch goal include painted miniatures so they are going to look even better. What advice would you give for someone who wants to use Kickstarter to publish their own game? First, don’t use the most successful projects as your benchmark. Some games really catch fire and just steamroll to really amazing numbers. Those are the ones that stand out and I think it’s really easy to think “wow, my game is as good as that one, I should be able to hit a similar goal”. Well, it doesn’t work that way. There are so many other factors involved with any given project that there just isn’t any way to predict what will take off and what won’t (unless you are one of those Big Companies doing the same thing over and over). Secondly, if you launch your campaign and it has a really slow start, think about using the campaign to build a community and improve the game (and campaign) for a relaunch. I wasn’t expecting to do this, but a great core of backers developed during my first campaign – giving me both the advice and encouragement I needed to try again. You have to be willing to listen to criticism and make changes, but it can mean the difference between failure and success. If you want more information, be sure to check out the Shadowstar Corsairs Kickstarter page. I do have to say it looks rather impressive, and I’m glad to see that Ryan decided to try again instead of letting the game die.